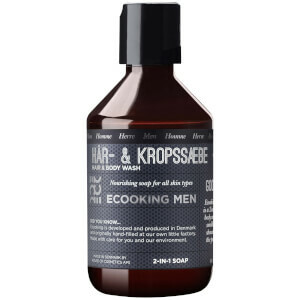 The Ecooking Men Hair & Body Wash is a 2-in-1 cleanser for the hair and body. Formulated with a cocktail of beneficial ingredients, including moisturising organic Aloe Vera and organic Glycerin, the hair and body shampoo effectively cleanses and nourishes to leave the skin and hair feeling purified and energised. Its dose of Hydrolyzed Wheat Protein adds shine to the hair while protecting against irritation on skin and scalp. Also contains Organic Abyssinian Oil to help strengthen hair and improve elasticity and density. May be used daily both as hair and body shampoo. Rinse off all remains of soap with water. May be used on all skin and hair types. Aqua**, Aloe barbadensis Leaf Extract*, Sodium Laureth Sulfate, Cocamidopropyl Betaine**, Polyquaternium-47, Sodium Cocoyl Glutamate**, C12-15 Pareth-12, Phenoxyethanol, Glycerin*, Sodium Chloride, Sodium PCA**, Hydrolyzed Wheat Protein**, Parfum**, Citric Acid, Caprylyl Glycol, Potassium Sorbate, Sodium Benzoate.